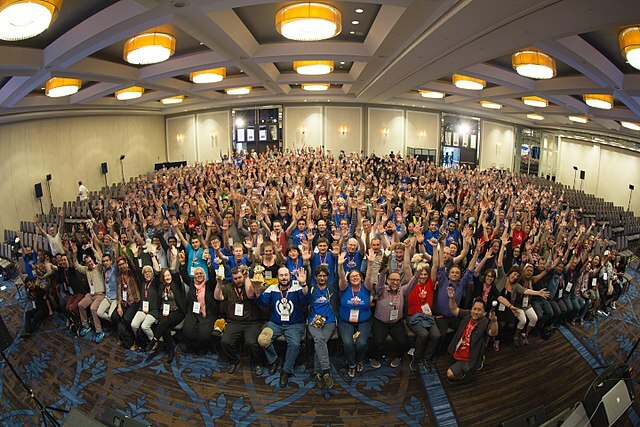 Last month I had to privilege to attend the Wikimania conference in Montreal, Canada, where 900 people from around the world gathered for two days of hacking and building and then three days of conference sessions. The conference scope includes not just the Wikimedia projects but also the big themes of open education, open access, community building, and privacy and rights in the digital age. One blog post by one attendee is only going to capture a sliver of what went on, and here I am summarising some big projects of most relevance to university research projects and GLAMs. This time round, Wikidata rather than Wikipedia was generating the most excitement. Wikidata, the free structured knowledge-base, is going through a period of explosive growth, helped in a small part by data shared from partner institutions including Oxford University, and the conference brought together many people using Wikidata to document cultural heritage and current knowledge. A takin is a Himalayan goat-antelope with whom I feel a personal connection, and the reason goes back to an event I attended in 2011. The wildlife charity ARKive had allowed some of its descriptions of threatened species to be copied into Wikipedia. After presentations introducing both ARKive and Wikipedia, we split up the room. One table took birds, another took lizards, and I must have been among the mammals. After carefully reading what ARKive and Wikipedia said about the takin, I found a couple of sentences that could be copied from one to the other. Everyone in the room made a small but concrete improvement to their target Wikipedia article. The trainer at the event, Andy Mabbett, thanked me afterwards with a message through Wikipedia. Making that change, and being recognised for it, connected me to the topic that a film or lecture could not. Somehow the takin had become my endangered mammal. People had turned up with a general curiosity about threatened species, engaged with the question of how to describe a specific species and had a positive experience with a peer-reviewed source – the ARKive site. with a way to track individual contributions. We want to thank and reward contributors, and it’s also useful to assess the quality of their work. For a big, long-term project we might want something like a leader-board or a participation award. have contributor records which publicly show what changes each user has made, even allowing ‘thank you’ messages for individual changes. Perhaps most relevant is that Wikimedia resources do not exist in isolation but are derived from something else. A fact in Wikipedia or Wikidata needs to be backed up with a citation of a reliable source. A photo in Wikimedia Commons needs a description of where it was taken, or a citation of the collection it is drawn from. A transcribed text in Wikisource needs a pointer to the page scans that were transcribed, and ultimately to the physical copy of the book. So a Wikimedia event is always necessarily about a Wikimedia project and something else: a scholarly site or database, or physical exhibits, books or artworks. Four Wikimedia projects hold distinct types of information about the same subject. The best-established type of public event is a Wikipedia editathon, in which visitors are invited to write Wikipedia articles. Newcomer participants in editathons usually achieve little, because a lot of time and thought is needed to get to grips with Wikipedia’s interface, with Wikipedia’s culture and norms, and with the sources they will be using. Editathons can be very productive if participants are confident wiki editors, but that confidence does not come immediately. Fortunately, the Wikimedia projects offer simpler, less demanding ways for the public to engage with a subject. 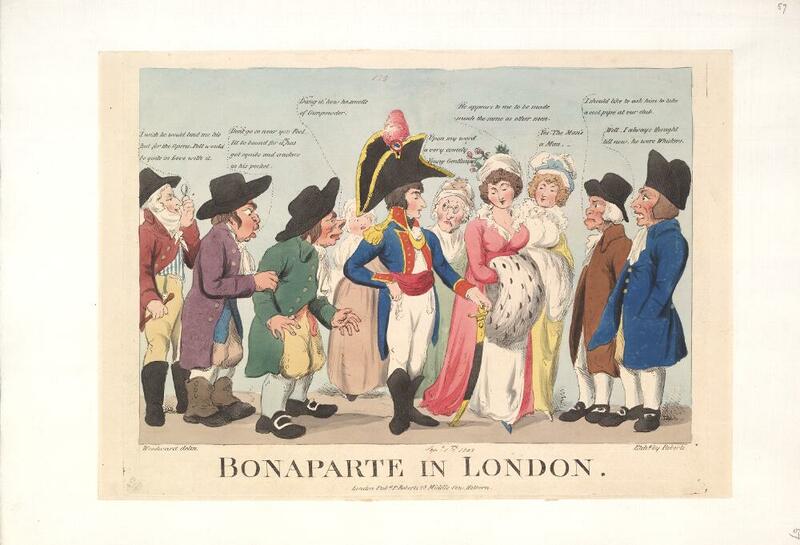 Looking to create events for the Ada Lovelace Bicentennial in 2015, I read about Mary Somerville, a 19th century mathematician and scientist who tutored Lovelace and for whom Somerville College is named. I could find none of Somerville’s works in electronic form, but some were available as scanned documents in the Internet Archive. This suggested how we could engage an audience interested in women scientists. Wikisource is a platform for sharing and connecting out-of-copyright or freely-licensed text. 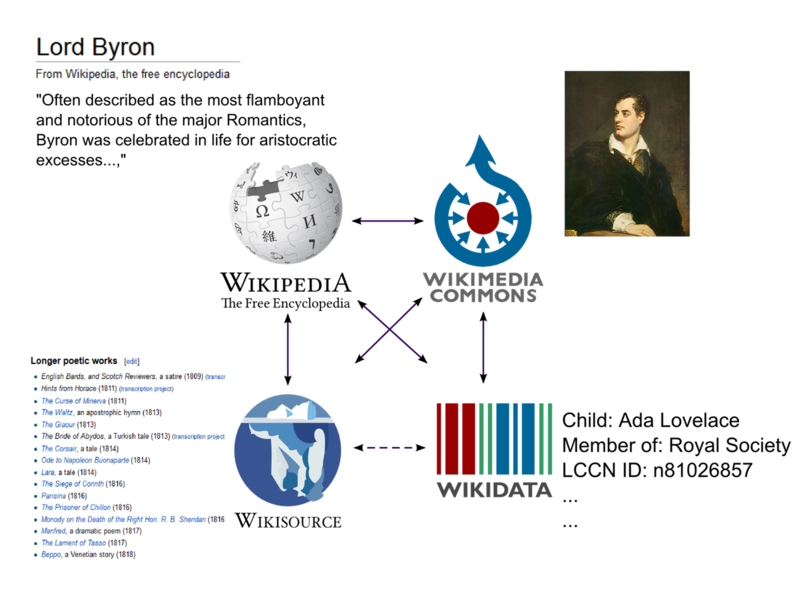 Wikipedia’s article about Lord Byron summarizes his life, with brief mentions or quotes from his work. 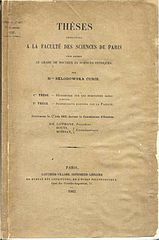 Wikisource, on the other hand, has a brief description of who he was and the full text of many of his poems and other works. Naturally, the two profiles link to each other. Most works on Wikisource come from scanned books which have been put through Optical Character Recognition (OCR) and then manually fixed. Each page has to be checked and approved by at least two different users before it is considered “validated” and ready for public readers. Attendees at the event were given a shortened URL for the transcription and each got a post-it note with the page number that they should fix. They adapted to Wikisource at different rates, but that worked out fine because the quicker, more confident people checked and tweaked the work of those who made slower progress. In two hours, we got through one paper and a large proportion of a book by Somerville. After some further checking, these texts were linked from the front page of Wikisource. Feedback on the event was very good: participants recognised they were doing something important; not just learning about Somerville but helping to republish her work. The “transcribe-a-thon” format has been repeated as a conference session. 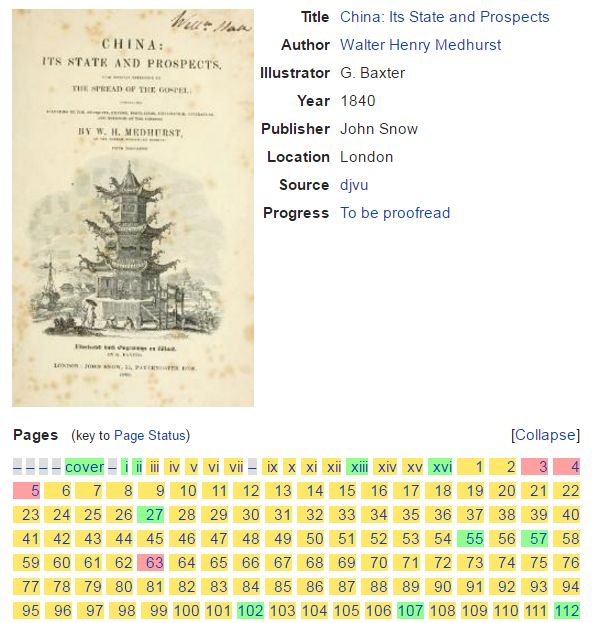 A transcription project on Wikisource: pages are yellow when they’ve been approved by one user, and green for two users. A transcribe-a-thon needs some careful preparation in choosing the text, importing it into Wikisource and preparing it for transcription. The import process on Wikisource is documented, but not very intuitive, even for experienced wiki editors. Not all scans are suitable: if the images are poor quality, the OCR does not produce usable text and if there is non-standard text such as mathematical formalism, transcription will be too difficult for newcomers. A little more work is necessary once all the pages are validated, to assemble them into a single work. Wikipedia articles about a place or building usually have a geographical point, defined by latitude/ longitude pairs, attached to them in a machine-readable way. For example, the article about Oxford has coordinates that correspond to the central junction at Carfax. Wikidata, another sister project, has many more entries with locations, for items such as listed buildings. 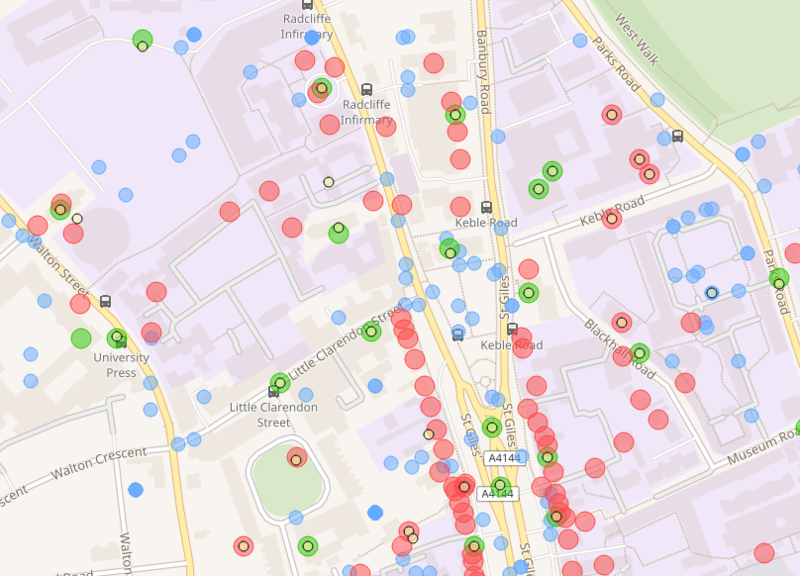 On some historic streets, almost every building has a Wikidata entry. 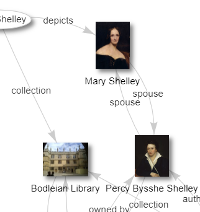 WikiShootMe is an online mapping tool that shows these articles and Wikidata items, colour-coded according to whether they have an image. It also allows users to upload images, but they need to register an account first on Wikimedia Commons. The images do not have to be professional quality, and photos taken with a smartphone or cheap digital camera are often suitable. As more images are uploaded, red dots disappear from the map. So for an event or campaign that gets people engaged with local history, public art, or architecture, the group can decide on places to photograph and describe, then go to the location, and either upload their images from home or return to a central computer room and transfer images from their devices. A tip to monitor contributions: when uploading an image, users are prompted for image categories. If they all add the same category, then it is possible to track images uploaded with that tag using PetScan (explained below). However, categories are case-sensitive so you have to make sure people type the category tag exactly as instructed. Commons helps by colouring the text red if it does not correspond to an existing category. A Wikipedia account will work if you already have one of those. Click ‘Allow’. This will permit WikiShootMe to accept your photo, and return you to the map. Give the image a title, description (say what you’ve photographed, e.g. the address of the building) and date. In the Category box, type Buildings in Oxford with that exact capitalization. PetScan is a tool for customised queries If you are running an event or campaign where people create or upload images to a given category, use this procedure to get an overview of their contributions. Select the Page properties tab and click the checkbox next to File. Select the Output tab, then choose Sort by date, Sort order descending. Click ‘Do it!’ and on the resulting page, bookmark the link ‘for the query you just ran’. This gives you a list of images in the category, most recent additions first. Clicking on an entry in the list will take you to the full description of that file, including the user profile of the uploader. Use a biographical source to add individual facts, such as universities attended or birthplaces, to Wikidata entries or Wikipedia articles. Examine a free image source (e.g. Europeana’s World War I collection) and find Wikipedia articles that the images can illustrate. Search through audio archives for short clips that can be uploaded to Commons and embedded in Wikipedia articles about a person or event.